Even as its flagship LS400 sedan went on sale in 1989, Toyota was already considering the next steps for the Lexus brand. Plans included a new entry-level sedan to replace the underwhelming ES250 and a new midsize sedan, the GS, to slot between the existing ES and LS models. The most interesting development, however, was the conception of a Lexus coupe. Big premium coupes and convertibles like the Mercedes-Benz SEC and SL, Jaguar XJS, and BMW 6-Series occupied a small but lucrative market. They sold in modest numbers, but well-heeled buyers were willing to pay a sizeable premium for their distinctive styling, making such cars very profitable. They also served as style leaders for their brands, adding luster to the rest of the line. Several other automakers had recently tried to break in to the high-end two-door segment with mixed results. Cadillac’s Pininfarina-styled Allanté roadster and Buick’s two-seat Reatta had failed to lure buyers away from the established European leaders despite significantly lower prices. The Cadillac Eldorado and Lincoln Continental Mark VII lacked the cachet or sophistication to appeal to BMW or Mercedes buyers, while Honda’s Legend coupe was more of a two-door sedan than a posh sports coupe. Still, the coupe market remained a tempting target. Nissan, which launched its Infiniti brand in 1989, had clearly thought the same thing. Shortly after the debut of the Q45 sedan, Nissan introduced an Infiniti coupe, the M30. An Americanized version of the Japanese-market Nissan Leopard, the M30 was upright and fairly sedanish, combining bland styling and unexceptional performance. Unsurprisingly, it made no particular impression on coupe buyers and Infiniti dropped it in short order. Toyota had several options for developing a Lexus coupe: First, they could do as Mercedes had with its S-Class coupes and simply create a two-door coupe or hardtop version of the LS400 sedan, although the LS400 was so stylistically conservative that the results would likely have been disappointingly bland. A second alternative was to create a Lexus version of the Toyota Soarer, a home-market rival of the Leopard, but the existing Z20 Soarer was then nearing the end of its design cycle; it had bowed in early 1986 and its basic themes dated back to the first-generation Soarer, launched in 1981. The third and most promising option was the most challenging: creating something wholly new and better suited to American tastes. Understanding the preferences of the U.S. market had always been a challenge for the Japanese automakers, whose designers and engineers often had very different values than did their American customers. In the sixties and early seventies, Nissan had benefited (whether they appreciated it or not) from the insights of Yutaka Katayama, head of NMC USA, whose tastes were more in line with those of the American market. Toyota, for its part, decided to seek American help and in 1964 had hired Strother MacMinn, a teacher at the Art Center of Pasadena, California, to train the company’s Japanese designers. From the beginning, MacMinn had warned Toyota management that it was going to be very difficult for the company’s designers to truly grasp American priorities without actually experiencing day-to-day life in the U.S. In 1973, the company took that advice to heart and established a new U.S. subsidiary called Calty (from “California Toyota”) Design Research Inc., originally based in a warehouse in El Segundo, California, just south of the Los Angeles International Airport. The first production design to emerge from Calty was the second-generation (A40) Toyota Celica, which proved very successful in the U.S. market. In 1978, shortly after the A40 Celica went on sale, Toyota relocated Calty to a new studio in Newport Beach in Orange County, California. The design subsidiary hired a new chief stylist, Ford veteran David Hackett, and began recruiting young designers like Dennis Campbell, hired in 1980, and Erwin Lui, hired shortly after graduating from the Art Center in 1982. Since Calty’s staff was relatively small, generally quite young, and located thousands of miles from the more conservative environs of Detroit or Toyota headquarters, the California studio had always demonstrated a certain flair for the avant garde. With that in mind, it’s perhaps slightly less surprising that Campbell and Lui, whom Hackett assigned to the coupe project, created their initial design studies using plaster-filled balloons rather than pencil and paper, yielding a curvaceous, organic shape that decisively rejected both the angularity of the outgoing Soarer or the sedan-like shape of the W124 Mercedes SEC. Even after the basic shape was established, much of the design work was done with clay models rather than flat renderings. Toshihiro Okada, head of Toyota product planning back in Japan (and the project leader for the two previous Soarers), was not thrilled with either the unorthodox approach or its early results, but he gave Campbell and Lui permission to develop the design into a full-size clay model. To their relief, when they presented the clay to him six months later, he was very pleased with it, as was chief project engineer Seihachi Takahashi, who would become an important ally. The problem with allowing designers to indulge themselves or pursue unusual directions is that at some point, their work must be translated into a producible car. Usually, automotive stylists are expected to work within the bounds of a specific ‘package’ of fixed dimensions and engineering parameters; in many cases, the designers don’t even begin until after the package has been established and validated. That approach ties designers’ hands, but it also helps to ensure that the results of their work will fit the intended platform and allow room for sundries like engines, fuel tanks, and passengers. The Lexus SC’s curvaceous shape posed significant production challenges for Toyota, although we think the results were well worth the effort. The inboard lights are the high beams, which were separated from the main beams for space reasons. Despite its sleek looks, the SC’s coefficient of drag was not quite as good as that of the LS400 sedan: 0.32 (or 0.31 with the optional rear spoiler) for the coupe, compared to 0.30 or 0.29 for the sedan. Although Campbell and Lui had pushed their original design concept as far as possible, they fully expected that they would have to make compromises further down the road. That’s an inevitable part of the process, but it can have painful results; the history of automotive design is littered with examples of attractive concepts that were weakened, if not ruined, in the translation to production reality. In this case, something very unusual happened: Takahashi was so passionate about the original design that he became determined to build it with as few changes or compromises as possible, even where the original design was significantly off-package. It would be no easy task; the coupe’s complex curves were extremely difficult to render in steel and some of the planned components — like the LS400’s 1UZ-FE V8 engine — simply didn’t fit. The narrow, grilleless nose didn’t provide enough radiator exposure and didn’t leave enough room for even compact projector-beam headlights. The Z30 Lexus SC shares its basic double wishbone suspension layout with the later A80 Toyota Supra, although the actual geometry and tuning were significantly different for each application. Note the very long front doors; they have unique dual-pivot hinges to enable rear passengers to get in and out in confined spaces. This feature was introduced on the previous Z20 Soarer, not sold in the U.S. The finished design was not identical to the original clay, but considering how far the original design had pushed the envelope of production feasibility, the final product remained surprisingly close to the original and in some respects even improved on it. It was a remarkable achievement. With some notable exceptions, big coupes tend to look sportier than they drive, aimed as they are at well-heeled and often older customers. However, the earlier Z10 and Z20 Soarers had used substantially the same chassis and engines as the contemporary Toyota Supra and thus were fairly athletic, more akin to the BMW E24 6-Series than big American personal luxury coupes. The new coupe would continue in that tradition, being as much GT as luxury car; Toyota even hired race car driver Danny Sullivan to help the engineers fine-tune the suspension. Although the coupe had some mechanical commonality with the LS400/Celsior platform, the two cars did not share the same platform, at least by Toyota’s reckoning; they had separate chassis codes. (A shorter version of the coupe platform would be used for the next-generation Toyota Supra, although that too had its own chassis code.) Because of the coupe’s challenging shape, even the shared components often differed significantly. For example, the coupe version of the 1UZ-FE engine had a different air cleaner assembly to fit the tighter engine bay and adopted an unusual variable-speed hydraulic cooling fan. The coupe would also be available with the new JZ-series inline six and a manual transmission, neither of which was offered at all on the sedan. Japanese Soarers had always made a big selling point of high technology, so the Z30 Soarer would be available with (inter alia) adjustable shock absorbers, air suspension, a complex active suspension, and four-wheel steering. The Lexus version was less complex, presumably in an effort to keep the price down, offering only steel springs and conventional dampers. However, ABS was standard equipment, as were big vented disc brakes. Even the normally aspirated six had nearly as much power as the outgoing Soarer’s turbocharged six (shared with the U.S.-market Supra Turbo), which was useful because the new coupe was no lightweight. Even the SC300 weighed more than 3,400 lb (1,550 kg) and a loaded SC400 was close to 3,700 lb (1,675 kg). (The JDM 4.0GT-Limited with active suspension was heavier still.) However, the SC was at least 200 lb (90 kg) lighter than an LS400 sedan and had shorter gearing for better acceleration. Other than badging, the only obvious difference between the Lexus SC300 and SC400 is that the SC300 has standard 15-inch wheels rather than the SC400’s 16s. Six-cylinder cars are somewhat lighter than V8s. Until 1997, they could be ordered with a five-speed manual transmission; the manual was rarely ordered (although manual-shift cars are prized today) and was canceled toward the end of the model run. While their suspensions were tuned for a sporting feel, neither the Lexus SC nor its Toyota counterpart lacked for luxury features. The Lexus coupe offered much the same equipment as the LS400 sedan, including its distinctive electroluminescent instruments. Soarers were even more lavishly equipped, with standard digital instrumentation and options still largely unknown in the U.S., such as GPS navigation, an in-dash television receiver, and a backup camera. American press reaction to the Lexus SC400 was resoundingly positive. Most critics liked the sleek styling and were impressed with the coupe’s performance: 0-60 mph (0-97 km/h) in 7 seconds or less and a redline-limited top speed of 145 mph (233 kph). That was on a par with the Mercedes 560SEC and BMW’s outgoing M6/M635 CSi and more than a second quicker than an Lexus LS400 sedan. The six-cylinder SC300 was predictably less impressive with automatic, but with the five-speed could perform nearly as well as the V8 cars and helped to cement the SC’s position as a luxury GT rather than a plush cruiser. The SC’s handling sent a similar message. The LS400 was hardly a barge, but it had sacrificed ultimate cornering precision for plush ride quality. The coupe took the opposite approach; it had almost Germanic body control at the expense of a ride that was perhaps a little too stiff for the average Lexus customer. The SC was too big and heavy to be a nimble slalom-carver like a Volkswagen GTI, but it had impressive grip and superb balance. Surprisingly, both Car and Driver and Road & Track found the SC400’s brakes somewhat over-matched by its weight; the SC300 stopped better despite smaller discs. Whatever they thought about the ride, Lexus customers had no reason to complain about the price. When the Lexus SC400 went on sale, its starting price was $37,500, actually cheaper than a 1992 LS400. The 1993 SC300 started at only $31,100, which was a veritable bargain in this rarefied class. Despite the stiffer ride, the coupes were just as solid and well-assembled as the sedan, which made them among the highest-quality automobiles in the world. The Lexus SC was 191.1 inches (4,855 mm) long on a 105.9-inch (2,690mm) wheelbase, 6.4 inches (163 mm) shorter than the sedan on which it was based. SC400s, like this one, originally had 250 hp SAE (187 kW), climbing to 260 hp (194 kW) for 1996. For 1998, American SC400s received the new VVT-i engine from the LS400, still displacing 3,968 cc (244 cu. in. ), but now making 290 hp SAE (216 kW) and fitted with a five-speed automatic. This powertrain was not offered on the Z30 Soarer, where the V8 was discontinued around the time the new engine bowed on export cars. The Lexus SC sold well at first, although it was not a runaway hit. First-year U.S. sales amounted to 12,695 SC400s and almost 8,000 SC300s, which was not bad by coupe standards, but well short of the new Cadillac Eldorado, which was comparably priced but less polished and considerably less powerful. Worse, sales of the Lexus coupe sank almost every year. Combined production fell to a little over 16,000 in 1993 and just under 12,000 in 1994, dropping to around 5,000 units a year by 1996. A modest but unappealing facelift in 1997 didn’t help, nor did the addition of a more powerful V8 engine and five-speed automatic in 1998. In 2000, its final year, the SC sold only 631 units in the U.S.
Why didn’t the Lexus SC sell better? Rapid price escalation probably played a role. Like the LS400, the highly competitive initial price swelled rapidly, driven in large part by the strength of the yen relative to the dollar. By 1996, the SC300’s price had climbed to more $44,000 while the SC400 started at more than $52,000. That represented 40% increase from their debut, tough to swallow for basically unchanged cars. 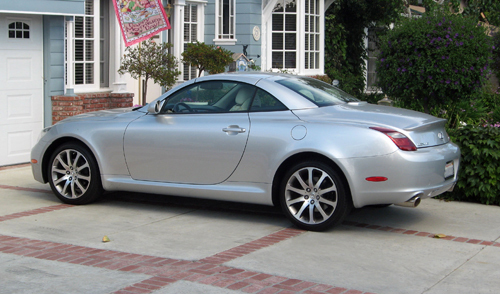 We suspect that Lexus SC’s sleek lines also left it in a difficult position in the marketplace. The SC400 was much racier than a big Benz or Jaguar coupe, perhaps a little too racy for conservative shoppers, but it was a little too big and too luxurious for sports car fans and the Lexus brand didn’t have the sporting cachet of Porsche or even Corvette. 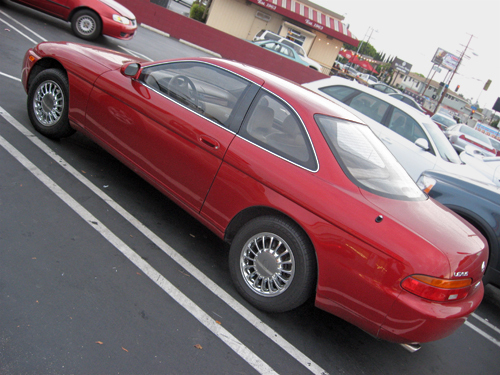 The JDM Toyota Soarer faced similar issues. The previous Soarers had been quite popular in the home market, but the Z30 represented a significant escalation in price, particularly in V8 form, and the previously booming Japanese economy was no longer so robust by the mid-nineties. Price was the likely downfall of the air suspension and active suspension variants, which were thoroughly impressive, but hideously expensive; a 4.0GT Limited with active suspension and 4WS cost twice as much as 2.5GT Twin Turbo and considerably more than a top-of-the-line Toyota Celsior, the JDM version of the LS400. Slow sales led to the demise of those models and the standard 4.0GT in August 1997, leaving the cheaper 3.0GT and 2.5GT Turbo. In partial compensation, the latter had been updated a year earlier with a single turbocharger and variable valve timing, yielding the same (probably underrated) 280 PS JIS (206 kW) as before, but significantly more torque. Sales remained poor. Both the U.S. and Japanese markets were facing a similar issue: The market for all coupes was shrinking dramatically as buyers became infatuated with trucks and sport utility vehicles. High-end Japanese sports cars were dropping like flies — annual sales of the Z30’s Toyota Supra platform-mate dipped below 10,000 units in 1995 and never recovered — and big luxury coupes were doing little better, leading to the demise (at least temporarily) of venerable nameplates like the Ford Thunderbird. 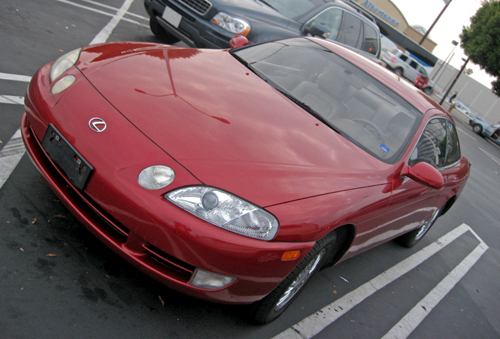 The first-generation Lexus SC and Z30 Soarer expired in July 2000, replaced that fall by a new Z40 model. Unlike its predecessor, the Z40 model was the work of Toyota’s Brussels design center rather than Calty and the new was no longer a two-door coupe, but rather the first Lexus retractable hardtop. Dubbed Lexus SC430 in the U.S., it was smoothly styled but awkwardly proportioned and far less sleek than its bullet-like predecessor. The Lexus SC430 was initially badged as a Toyota Soarer in Japan, but in late 2005, it became a Lexus in the home market as well, one of the first Japanese-market Lexus models. All versions were offered only with a V8 engine and five-speed automatic, shared with the contemporary Lexus LS430 sedan. The SC430 was slightly quicker than the previous SC400, but far less athletic, aiming for the same “relaxed sportiness” as its ill-starred contemporary, Ford’s nouveau Thunderbird two-seater. Like its predecessor, the SC430 sold relatively well at first — about 14,000 units per year in both 2001 and 2002 — and then dropped off quickly. By 2008, U.S. sales had fallen to fewer 2,000 per year. It expired in July 2010 without a direct replacement. Although the Calty studio was not involved in the design of the SC430, the California studio has not been idle. 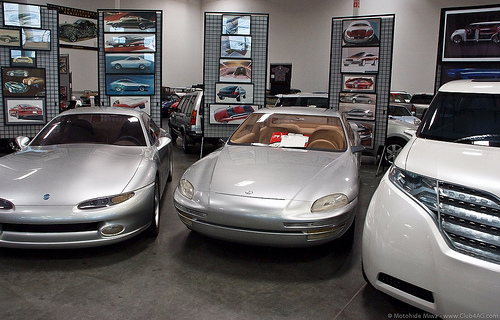 Wayne Lui, the original Lexus SC’s lead designer, went on to develop the edgy 2000–2006 Toyota Celica as well as the familiar space shuttle shape of the second-generation Toyota Prius. The Lexus SC had far less impact than the LS400 and failed to set the standard for its class the way Mercedes’ SL roadsters have defined theirs. Still, the first-generation Lexus coupe is on our short list of Japanese cars likely to become future classics. We must admit to being biased, for we consider the original SC400 to be the best-looking car the Japanese industry has yet produced and one of the finest automotive designs of the past two decades. Unlike a great many modern cars, it’s neither derivative nor self-conscious — it just looks good. Both the first-generation Lexus SC and Z30 Toyota Soarer have already developed a certain cult following. They were very solidly built and they’re quite reliable considering their complexity. The electroluminescent instruments can be problematic and the V8 requires a new timing belt and water pump every 90,000 miles (145,000 km), but all of the available engines are nearly bulletproof. The Lexus SC/Soarer is far less troublesome than a contemporary BMW 8-Series or Jaguar XJ-S, which can easily become money pits. Furthermore, six-cylinder SC300s and 3.0GT Soarers can use nearly all of the performance parts available for the Supra, offering the foundation for a formidable luxury hot rod. Over the years, Toyota has produced a number of unusual or out-there designs, not always to good effect, but none has been as radical as the Z30 SC/Soarer and, to our eyes, none has turned out nearly so well. More than 15 years after its birth, it’s still in a class of one. Since writing this article, we also did a more detailed piece on the Japanese-market Toyota Soarer. Our sources for this article included Patrick Bedard, “Lexus SC400,” Car and Driver Vol. 36, No. 12 (June 1991): 48-52; lex400sc, “Comprehensive Lexus SC300/400 FAQ,” Intellextual.net, 27 October 2004, www.intellexual. net/faq.html, accessed 20 June 2009 (which was the source of the Simon Humphries comment mentioned in the closing paragraph); Mike Covello, Standard Catalog of Imported Cars 1946-2002, 2nd ed. (Iola, WI: Krause Publications, 2001); Dennis Campbell’s Art Center biography (inside.artcenter. edu/ profile/ dcampbell/bio, accessed 8 October 2015); Julian Edgar, “Soarer 3-litre,” AutoSpeed No. 494 (21 August 2008), www.autospeed. com, accessed 21 February 2014; the Editors of Motor Trend, “Motor Trend‘s 1992 Import Car of the Year,” Motor Trend Vol. 44, No. 3 (March 1992): 44–69; Larry Griffin, “Lexus SC400: Okay, kids, can you say ‘ballistic? '” Car and Driver Vol. 37, No. 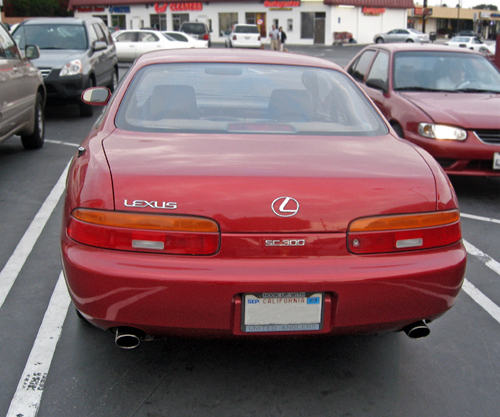 4 (October 1991): 109-113; and “Lexus SC300: Three liters. Five speeds. The Tooth Fairy Delivers,” Car and Driver Vol. 37, No. 11 (May 1992): 89–92; Jikayousha (Private Car) Buyer’s Guide Spring ’87 Edition, February 1987; Michael Knowling, “Pre-Owned Performance – Lexus SC400/Soarer V8,” AutoSpeed No. 8 (1 December 1998), www.autospeed. com, accessed 21 February 2014; “Step into a Soarer,” AutoSpeed No. 347 (6 September 2005), www.autospeed. com, accessed 21 February 2014; “Sumptuous Soarer,” AutoSpeed No. 184 (4 June 2002), www.autospeed. com, accessed 21 February 2014; “Swooping Soarer,” AutoSpeed No. 240 (25 July 2003), www.autospeed. com, accessed 21 February 2014; “The Highest Soarer,” AutoSpeed No. 459 (30 November 2007), autospeed. com, accessed 21 February 2014; and “Toyota Soarer Twin-Turbo,” AutoSpeed No. 155 (6 November 2001), autospeed. com, accessed 21 February 2014; “Lexus SC 400: Lexus creates the target,” Road & Track Road Test Annual 1992 June 1992: 76-81; “Lexus SC400 Production History” (n.d., Lexus Soarer Owners Club, www.lexusclub. co.uk, accessed 19 June 2009); Brian Long, Celica & Supra: The book of Toyota’s sports coupes (Dorchester, England: Veloce Publishing, 2007); New car price guide, 5 November 1993, Car and Driver (Japanese) 10 December 1993: 220–229; “1998 All Driving Album,” Driver No. 785 (June 1998): 143–155; Productioncars.com, Productioncars.com Book of Automobile Production and Sales Figures, 1945-2005 (N.p. : 2006); Mark Rechtin, “Creation of Calty launched new era of California car design,” Automotive News 29 October 2007; Rob_RA40, “The History of Toyota’s M Engines …” eds.au.com, Toyota Engine Development, n.d., users.tpg.com.au/ users/loats/technical/ mhistory/mhistory.html, accessed 16 August 2013; Masaaki Sato, The Toyota Leaders: An Executive Guide, trans. Justin Bonsey (New York: Vertical, Inc., 2008); “Sports & Specialty: Toyota Soarer,” Driver No. 785 (June 1998): 58; Marshall Schuon, “About Cars; From Lexus, a Coupe to Make Your Own,” New York Times 14 July 1991, www.nytimes. com, accessed 19 June 2009; Don Sherman, “Toyota Supra,” Car and Driver Vol. 31, No. 9 (March 1986), pp. 81–86; Steve Spence, “The Road to Zacatecas,” Car and Driver Vol. 38, No. 12 (June 1993), pp. 42–59; Toyota Motor Corporation, “A 75-Year History Through Text,” 75 Years of Toyota, 2012, www.toyota-global. com, accessed 20 February 2014; [“News from Toyota: Toyota Soarer Full Model Change”], [Japanese press release], 7 May 1991; 75 Years of Toyota: Vehicle Lineage: “Celica Coupe (2nd),” “Celsior Sedan (1st),” accessed 19 August 2013; “Soarer Coupe (3rd),” and “Soarer Coupe (4th),” 2012, www.toyota-global. com, accessed 20 February 2014; “The Lexus LS Chronology,” pressroom.toyota. com, accessed 16 June 2009; Toyota Motor Sales, “New Soarer” [Japanese brochure], January 1986 and “Soarer” [Japanese brochure], May 1991; Toyota Motor Sales, Lexus Division, [Lexus SC400 dealer introduction video], RaySC400, “1992 Lexus SC400 dealer introduction video,” YouTube, https://youtu.be/-a4-odN2oIU, uploaded 29 September 2006, accessed 19 June 2009; “Toyota Soarer,” www.allcarwiki. com/ wiki/ Toyota_Soarer, last accessed 1 May 2014; Gary S. Vasilash, “Inside CALTY,” Automotive Design and Production, n.d., www.autofieldguide. com, accessed 19 June 2009; and the Wikipedia® pages for the Lexus SC (en.wikipedia.org/wiki/Lexus_SC, accessed 19 June 2009) and Toyota Soarer (en.wikipedia.org/wiki/Toyota_Soarer, accessed 19 June 2009). As one who owned a SC300 (acquired new in ’95) as well as two first generation LS400s, your articles brought back a lot of memories. When I was researching the purchase of my coupe, I noticed that virtually all of the road tests of the SC300 were manual transmission cars – yet, as you say in your article, they were impossible to find at a dealer. While the automatic was adequate, especially for this class vehicle, I always wondered what I missed! The suspension was indeed stiffer than a typical Lexus but was by no means harsh. It is safe to say of its contemporaries in the model lineup that this was the one Lexus that cound handle! Another novel detail in the car was a rather complex articulated door hinge so the rather long front door could open in less space than a simple hinge would allow. In 1996 the Japanese market Soarer replaced the twin turbo engine with a much improved single turbo VVTi engine, which while officially rated at the same power, produced more torque at 2400rpm than the old twin turbo did at 4800rpm. Aaron, there’s a fair bit of information in (English :))on the JDM Soarer from Australia, NZ and UK. I’m curious about your use of the word “bowing”, what do you mean by it? “Bow” is of course a homophone but none of the usual meanings can be deduced from context (at least, by me :)). I bought my 5 speed manual, black ’93 SC300 in July of 1993 – which at the time cost more than I made a year! I still own it today and it is virtually perfect and has just 40,000 miles on the odometer. I may never sell it – a wonderful car and a joy to drive. I have not done a single repair in almost 17 years, and right now all it needs are new trunk lid struts to be as perfect as the day I drove it home. 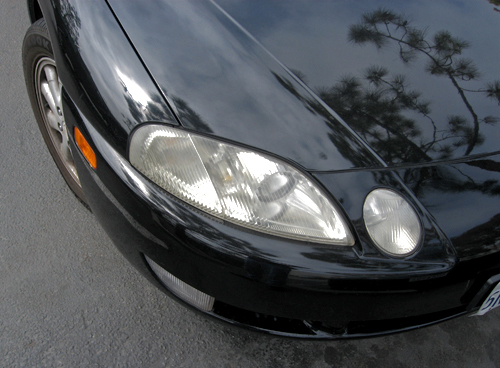 SC Owner – We have a ’99 SC300 with about 88,000 miles on it and we love it. It’s actually our second one. The first, a ’98 SC300 got totaled so we went out and found the ’99. Like yours, the only thing ours needs is the trunk lid struts. Getting groceries in and out of the trunk is a pain when you have to hold the lid up with your head! Yep – that is how I get groceries into my trunk too! Mine did not get out of the garage at all last year for various reasons. This year it gets new fluids, new tires and new trunk struts to give my head a break! I lived through those tough times with the trunk lid ;-) I changed out the trunk struts a few months ago. Next I got four new Michelin PS2 tires for it and am loving having it back on the road. Now if I could just figure out how to retrofit that active suspension – shouldn’t cost a lot more than my house. What was your impression of the active suspension? I’ve never even seen a road test in English. The 30 series Soarer was introduced in Japan in 1991. This was an entirely new car and followed in the footsteps of the 10 and 20 series Soarers which were effectively two door variants of the local Cresida saloon car. The 30 series Soarer was built on the Supra platform with a slightly longer wheelbase and was released in 5 model variants. JZZ30 – 2.5 litre inline 6 cylinder with twin turbochargers. JZZ31 – 2.5 litre inline 6 cylinder normally aspirated. UZZ30 – 4.0 litre quad cam V8 with coil springs and shock absorbers. Effectively a poverty pack V8 with velour seating, basic stereo, manual adjust column, manual seats and few luxury appointments. UZZ31 – Same 4.0 litre engine but with TEMS (Toyota Electronically Modulated Suspension) which saw the car fitted with Tokiko gas shockabsorbers wearing air bags to replace the coil springs. Shock absorbers were electronically controlled with variable damping and the airbags wear also electronically controlled for height and firmness. Standard items included memory seats, memory electronic column, heated and folding mirrors, auto headlights, projection dashboard and traction control. Optional was the premium sound system controlled by a touch screen fully operation television and 12 stacker CD player. The model culminated in the UZZ32. With all of the trimmings available on the UZZ32, but with computer controlled active hydraulic suspension. Toyota did away with the shockers, springs and stabilizer bars and created a masterpiece in suspension design and geometry. With inbuilt G sensors to control pitch and dive, yaw sensors to control side to side body roll the system is truly an engineering feat that few manufacturers have even yet been able to out perform. Imagine a svelt luxurious sports coupe that cannot dive under the hardest of braking. It can’t squat on take off and it canot body roll even under the most difficult cornering. Always stable, always perfectly balanced and poised. This example of automotive excellence ran a large hydraulic pump low down on the front of the engine. A single shaft running through the pump controlled hydraulic pressure in the front housing and then ran through into a smaller rear housing for the power steering. A series of nitrogen filled accumulators maintains constant pressure throughout the system, and fluid transfer is controlled by a very complex valve body unit fitted below and behind the left hand headlight assembly. With speed controlled four wheel steering, the active Soarer remains one of the most amazing vehicles ever built. Due to the extremely high purchase price (nearly double the UZZ31 when released in Japan) sales were limited and in fact this car became the second shortest Toyota production run with only 873 examples finding their way onto the roads of Nagoya. I currently run no 825 a 1994 UZZ32. It covers around 350 miles a week up and down the M1 in England and it is my 2nd 32. I intend to keep this one, it is nothing short of fantastic, the ride handling and performance perfectly matched. It has been 100% reliable with normal servicing. Everything works just like the day it left the factory, not bad for 21 years old. I have a 97′ 300 with 241K on it, a 95′ 400 with 130K and a 95′ 300 5 speed with 68K on it. They are by far the best cars I have owned. I added a BC Racing coiler suspension to two of them and that makes an incredible difference in the handling. Body roll is pretty much non existent. There is so much support for the turbo Supra, this car is pretty cheap and easy to turn into a 800hp turbocharged monster. I will only spend about 5K to get the 5 speed up to around 700-800hp. The R154, V160 and CD009 transmissions work in the Sc to handle the upgraded power. The LS400 and Supra TT 4 piston brakes also fit with minimal modification to assist in stopping the beast after the single turbo upgrade. I couldn’t be happier with these cars! There was only 815 UZZ32’s produced. I bought my Lexus 1993 SC 400 two years old in 1995….At the time it had 26,000 miles on it. Now close to 300,000 miles it is still cruising beautiful. My only wish would be to get the suspension corrected to try and get a better ride as I feel the bumps in the road a lot these days. I’ve had most of the suspension replaced thinking it would improve but I have been quite disappointed with the outcome. No obvious improvement. Just put some new Michelins on it but haven’t noticed any noticeable improvement. Any tips from anyone would be great…..All in all I have and still love the car. I’m not at all qualified to give mechanical or repair advice. The only thing I can say is that a deterioration in ride quality is generally attributable to a) tires; b) shock absorbers; and/or c) bushings, which on a car like the Z30 would include not only the suspension bushings themselves, but also the ones between the subframes and the body. I can’t help with parts, sorry!